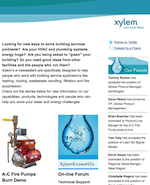 XylemKnowsH2o is the social media component of Xylem – Applied Water Systems. We are here to discuss the world’s water issues. With innovative systems in almost every area of water handling, control, treatment and distribution, Xylem is deeply involved in the cycle of water. What Do You Know About Heat Pump Systems? Being Part of the Bigger Picture. What makes relationships successful? San Antonio, the land of epic battles, flowing rivers and the Alamo was home to the 30th AFSA Convention & Exhibition last week. The American Fire Sprinkler Association convention offered multi-track, educational sessions to fire safety professionals while manufacturers such as A-C Fire Pump took part in the industry’s largest fire sprinkler exhibition in the United States. Why Bother With Hydronic Balancing? Most of today’s new HVAC systems are designed with individually controlled temperature zones to improve occupant comfort. Additionally, variable speed fans and pumps are becoming more commonplace to provide the exact amount of heating and cooling system capacity in a manner that minimizes overall energy usage. As such, the demand for testing, adjusting, and balancing is critical to balance today’s complex HVAC systems. CAN GREEN BUILDING CODES AND LEED COEXIST? While scanning various emails recently I came across one from the U.S. Green Building Council (USGBC) announcing that the Green Building Certification Institute (GBCI) has certified the 10,000th LEED commercial project. A very impressive accomplishment and one USGBC should be proud of. We’re Excited to Celebrate Our 1st Year! It’s been one year since we created the ITTH2OPROS social media network consisting of Facebook, Twitter, LinkedIn, YouTube and our Blog channel. In celebration of this auspicious occasion, we would like to thank all of our colleagues, friends, followers and fans for your engagement and support. We are delighted with the response we have received from so many of you in our community. Water World Week: What did we learn? By the time it takes you to read this blog, eight children in developing countries will have died from water-related illness. According to the United Nations and World Health Organization, more than a billion people lack access to potable water and half of humanity will be living with water shortages in 50 years. Here is a staggering fact. We know that safe drinking water is a precious asset and although 70% of the world’s surface is covered by water, only 1% of the total water resources on earth are available for human use. Today, that 1% is under threat as a result of population growth, urbanization and crumbling infrastructure. During this week’s World Water Week activities in Stockholm and around the world, we intend to do our part at ITTH2OPros by bringing you daily updates highlighting the urgent water-related issues being discussed. Last week we highlighted a few residential tips for saving money and energy during the winter months. Here are some tips that contractors, building engineers, commercial building owners and plant managers can use to winterize their facilities. Everyday Energy Tips helps you eliminate waste and shows you how you can save on your utility bills with everyday energy saving tips. Save H2o helps people understand all aspects of their restroom water usage. In just seconds you can calculate your savings. Waterprint calculates how much water is imbedded in your daily activities, including what you wear, eat and drink. The Responsible Bathroom app raises awareness for water conservation and provides tips to make your home and business more water friendly. Drip Detective shows you exactly how much water is running down your drain and the cost associated with any water leak. Water Buddy keeps a history of your water meter readings and provides an instant overview of your usage and whether you are keeping within your target. One Stop Green allows you to receive daily green tips, includes a solar, wind, water, and lighting calculator and lets you conduct home energy audits. myUse tracks water, electricity and gas usage and estimates your upcoming usage, so that you can make simple adjustments to conserve.